East of Round Swamp Road (now Battle Row Campgrounds in Old Bethpage) to east of Broad HollowRow (Route 110) in Melville. Identify the Motor Parkway bridge(s) that still can be seen in this aerial. Identify the location of Motor Parkway bridge(s) in this aerial that had been taken down. Broad Hollow Road Motor Parkway/Trolley Bridge in Melville. Which Vanderbilt Cup Races were held on this section of the Motor Parkway? None. 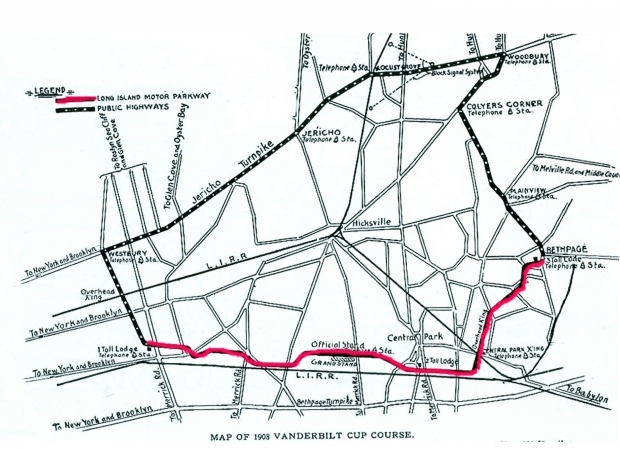 The most easterly section of the Motor Parkway used in the Vanderbilt Cup Races ended at Round Swamp Road as part of the 1908 Vanderbilt Cup Race Course. 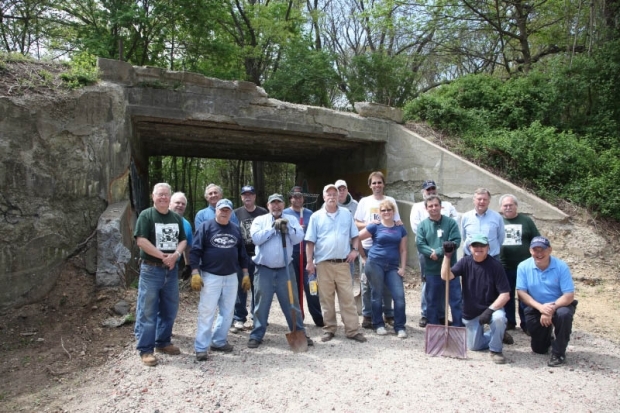 Congrats to Joe Oesterle, Michael LaBarbera, Tim Ivers, Frank Femenias, Dave Russo, Greg O., Art Kleiner, Brian McCarthy, Steve Lucas, and Frank Mendyk for correctly identifying the Old Bethpage/Melville section of the Motor Parkway. Kudos to Michael LaBarbera, Tim Ivers, Frank Femenias, Greg O., Art Kleiner, Brian McCarthy, Steve Lucas and Frank Mendyk for not falling for the trick question- No Vanderbilt Cup Races were held in this section of the Motor Parkway. Then & Now. Courtesy of Frank Femenias. Note: The bridge had been taken down by 1950. 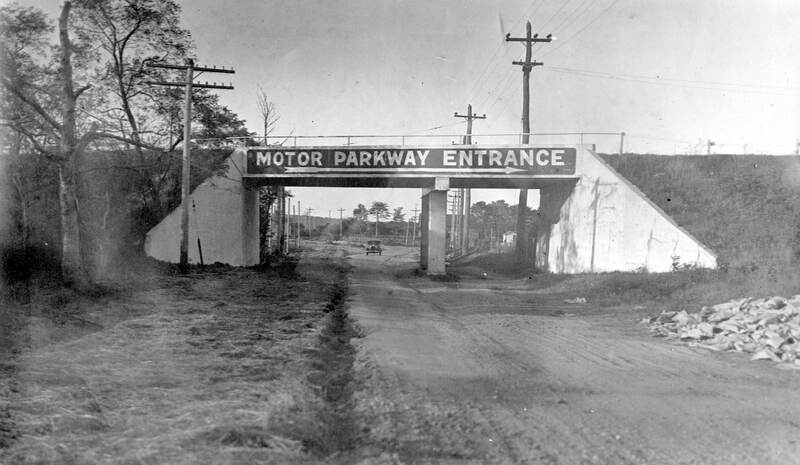 Nine miles of the Motor Parkway were used during the 1908 race. Nassau Suffolk Border, starting just east of the Bethpage Lodge on the right to Route 110 on the left. Bridge in the back of Old Bethpage Village and (in part) inside the sand pits still stand. The bridges over Clarmont Ave and over Broad Hollow Rd are gone today. Albertson? Between Searingtown rd and Willis Ave? Motor Parkway east of Round Swamp Road. We see the Round Swamp Road bridge, the Claremont Road Bridge and the Bethpage State Park Farmway Bridge, as well as the Melville Sandpit Bridge - the only 2 left are the one in BSP and the sandpit. I dont think any cup races were held there, but maybe some endurance runs. Twelve years after the parkway closing, this is the Nassau/Suffolk border between Old Bethpage and Melville. 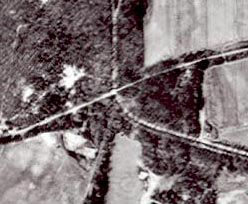 All bridges in this aerial were built in 1910. Broad Hollow Rd parkway bridge (Rt 110) appears removed. No races ran through here. Edith K. had a farm nearby off of Broad Hollow Rd. This is Bethpage. 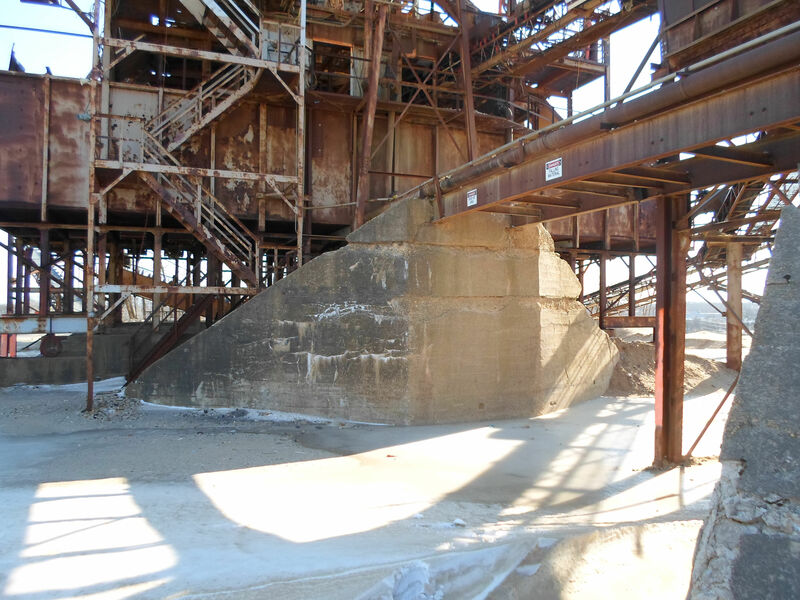 The LIMP is going through the restoration and the bridge there is visible, moving east through what is now the sand pit, proceeding east to 110. -Identify the Motor Parkway bridge(s) that still can be seen in this aerial. 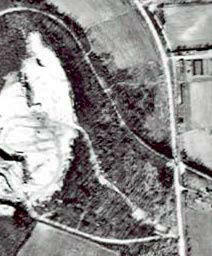 Only the Old Bethpage and Clody bridges (now within the sand pits) are in the photo, and still presently there. -Identify the location of Motor Parkway bridge(s) in this aerial that had been taken down. 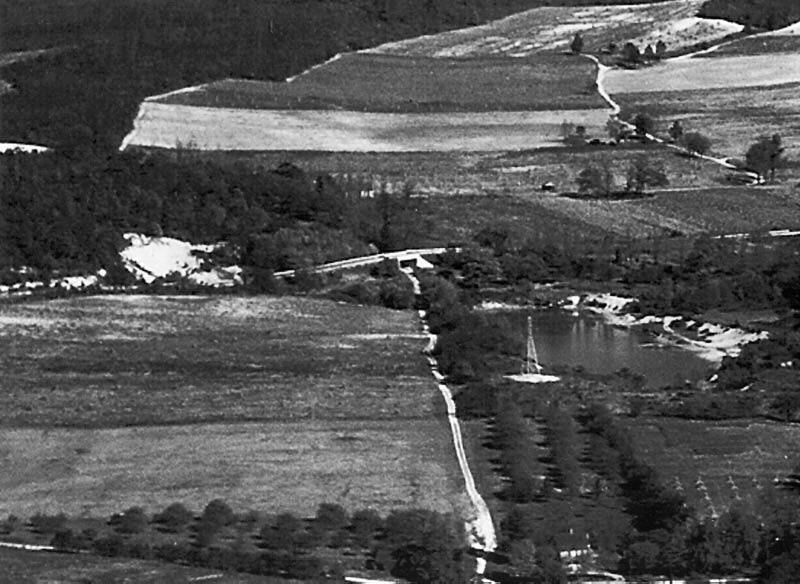 Of the 4 bridges within the borders of this photo; East to West- Claremont St PW Bridge/Old Bethpage PW Bridge/Clody Farm PW Bridge/Broad Hollow Rd Bridge- The Claremont and Broad Hollow bridges were gone by 1950. -Which Vanderbilt Cup Races were held on this section of the Motor Parkway? None! The 1908 came closest. The Bethpage lodge was just beyond the left border where the 1908 course turned North. Identify the location of Motor Parkway bridge(s) in this aerial that had been taken down. Don’t believe there were any. Which Vanderbilt Cup Races were held on this section of the Motor Parkway? None - Races ended at Round Swamp Road, just west of the beginning of the Motor Parkway in this area. *ID this section of the LIMP: From W/O Claremont Rd, Old Bethpage to E/O Broad Hollow Rd, Melville. 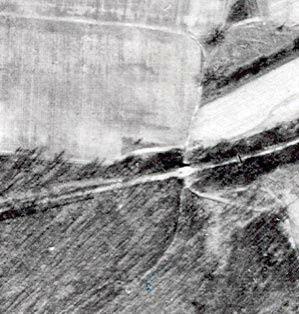 *ID LIMP bridges seen in Aerial: Claremont Ave ( appears intact ), Old Bethpage ( Claire Foster Farm ), and Clody Farmway ( utilized by Melville Sand Pits ). *ID LIMP bridge demolished: Parkway bridge that spanned over Broadhollow Rd&Trolley; Line. *VCR’s held within this section: None. With north at the top of the photo, this section is in the Old Bethpage / Melville area. 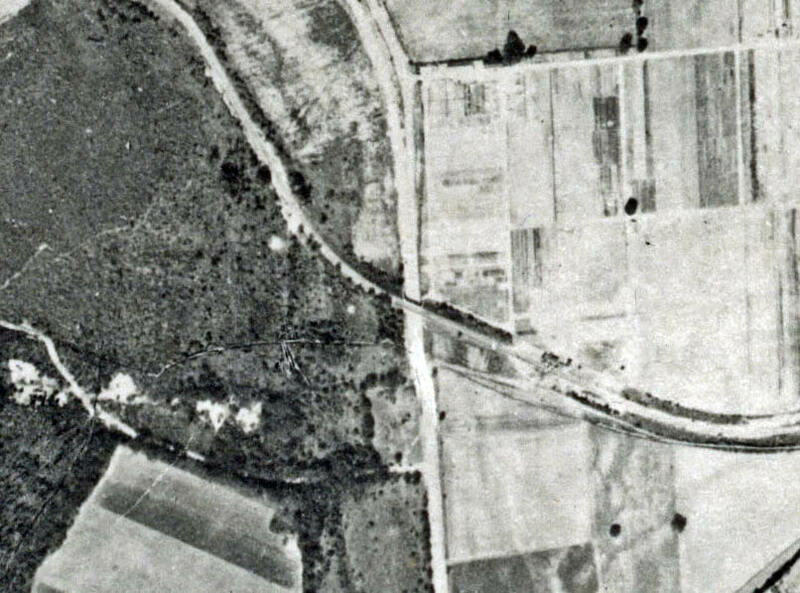 Four bridges were built along this part of the LIMP: (left to right) Claremont Road; Old Bethpage Village; Clody Farmway; Broad Hollow Road. The first three were still standing in 1950 with only Broad Hollow Road having been demolished. No races were run on this section although the 1908 race came close to the area, exiting the LIMP just off the left side of the photo at Round Swamp Road. The section of the Motor Parkway which you can observe in the photo is from just west of Claremont Rd (Battle Row campground today- Old Bethpage) to just east of Broad Hollow Rd (NYS RT. 110 - Melville). There are 3 bridges still standing in the photo, 1). Claremont Rd PW(ST), 2). Old Bethpage PW, 3). Clody Farm bridge. The Broad Hollow Rd (RT 110) was taken down by this time. None of the Vanderbilt Cup Races were held on this section of the Parkway. The 1908 race came off of the parkway and went onto Round Swamp Rd and then northwest. Round Swamp Rd is not displayed on the photo This would be just left of the left edge of the photo.